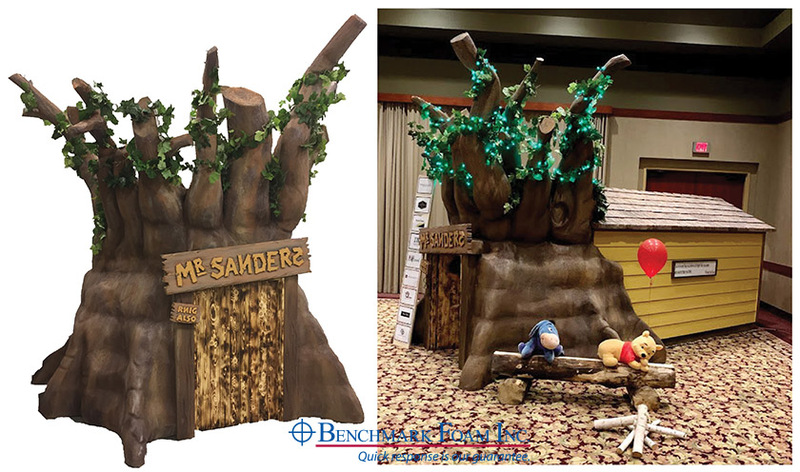 Teaming with a local contractor, Benchmark Foam created a playhouse depicted in the Winnie-the-Pooh series. Once completed, the playhouse was donated to a South Dakota Make-A-Wish fundraising event and raised $11,000. 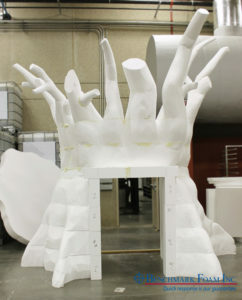 The front entrance of the playhouse is made of expanded polystyrene (EPS) foam that was hand-carved to replicate the tree stump exterior. The EPS is sprayed with a signature polyuria hardcoat that dries and gives the product its durability. The tree stump connects to the wooden playhouse, custom build by local contractor Crestone Builders, for a seamless transition once inside. While the tree stump stands nearly 10′ tall at the entrance, the interior play area is sized for children at approximately 5′ tall and 12′ deep. The completed playhouse is truly one-of-a-kind, which made its destination of Make-A-Wish, a perfect fit. For more information on all the replication capabilities of EPS foam from Benchmark Foam, contact our team at 800-658-3444 or 605-886-8084.